Abuja, Nigeria, 4 February 2013 – Following the inauguration of the National Competitiveness Council of Nigeria (NCCN) at State House today by President Goodluck Jonathan, its Chairman the Honourable Minister of Trade and Investment Olusegun Aganga, the Vice Chairman Tony O. Elumelu C.O.N, as well as members of the board, convened the council’s first meeting to outline the priorities for ensuring Nigeria’s competitiveness ranking increases by 2015. The Council identified infrastructure, technology, health and primary education as some of the areas in which the country needs to improve. Policy reform was acknowledged as another key focus point that could impact positively on the environment for ordinary Nigerians and contribute to stimulating FDI. By addressing these concerns with reformative actions, the NCCN believes it will be easier for Nigerian and foreign investors to do business in the country. At a press conference held later in the day where Aganga and Elumelu were joined by the Honourable Minster of Information Communications Technology, Mobolaji Johnson, and the Honourable Minister of State for Health, Dr. Muhammed Ali Pate, the Minister outlined to the media what he wanted the council to achieve. “I would like to see Nigeria improve its ranking by 75 places in the next four years,” he said, referring to Nigeria’s poor performance on the WEF’s Global Competitive Index and the Ease of Doing Business Index. 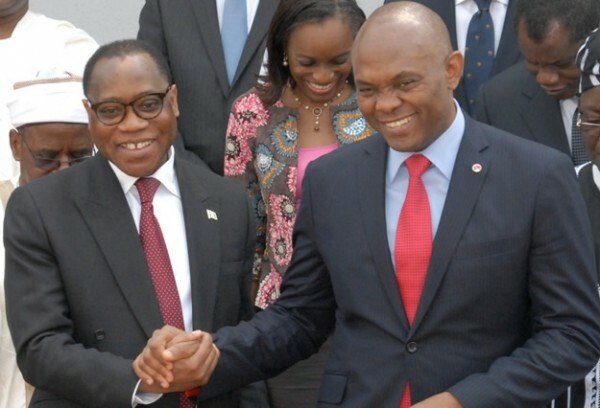 He went on to thank The Tony Elumelu Foundation who were involved in the establishment of the Council and are providing support by financing the role of the CEO of the Council. In addition to the Chairman and Vice-Chairman, the newly-appointed members of the NCCN board include Aliko Dangote, Funke Adekoya, SAN, Bola Adesola, Professor Esogbue, Yvonne Ike, Kolawole Jamodu, Omobola Johnson, Dr. Obadiah Mailafia, Oba Nsugbe QC, Frank Nweke Jr., Isaac Okemini, Austin Okere, Dr. Nwanze Okidegbe, and Saad Usman. Read the full text of President Jonathan’s speech here.